Hearing is one of our five senses. It converts sound waves to neural impulses that can be understood by the brain as sound. Only by understanding how the ear works is it its possible to fully appreciate what causes hearing loss. Sounds moving through air are best described as vibrations of air molecules. These vibrations create sound waves, which in turn are received by the human ear, collected and converted into neural codes to be interpreted by the brain. The ear consists of three parts: The outer, middle and inner ears. 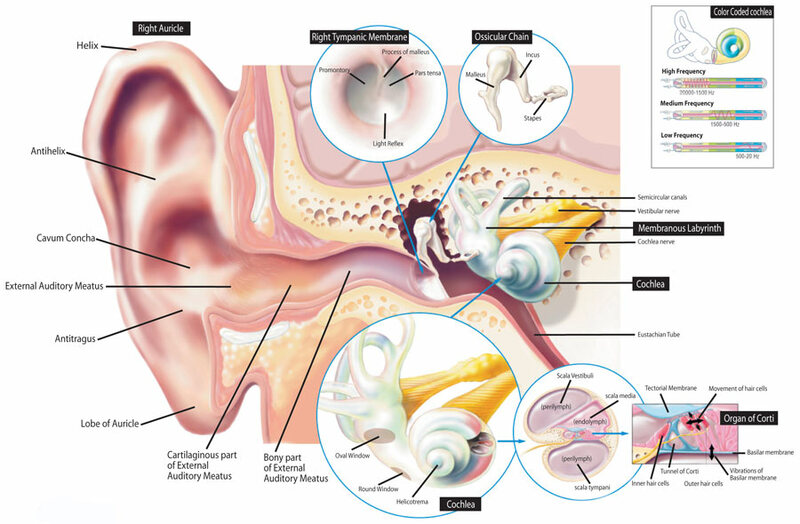 The outer ear is the external cartilaginous part of the ear and ear canal – the bit we see. 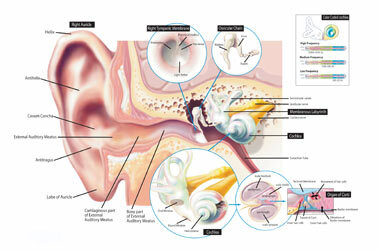 It functions as a funnel, collecting sound waves and conducting them to the eardrum, located at the end of the ear canal. This forms the boundary to the middle ear. The middle ear is an air-filled space. Air pressure in the middle ear is regulated by the Eustachian tube, which connects the middle ear to the nose and throat. There are three small bones in the middle ear; the malleus, the incus and the stapes – commonly called the hammer, the anvil and the stirrup. This chain of bones forms a lever mechanism, conducting the vibrations from the eardrum to the part of the inner ear that processes sound. The inner ear is a fluid-filled bone structure shaped like a snail shell. The connection between the middle ear and the inner ear is called the oval window. The footplate of the small stapes bone is attached to the oval window and functions as a piston moving the fluid of the inner ear. Inside the inner ear is the cochlea where there are about 23,000 outer hair cells, which are activated by this movement of the fluid. When the hair cells are activated, they send impulses to the brain, which then interprets these impulses as sound. The frequency of the sound determines which group of hair cells are activated, allowing us to distinguish between different sounds. If the hair cells are damaged due to age, illness or other causes, they have difficulty hearing certain sounds and differentiating between sounds. Large amounts of earwax can also considerably reduce the ability to hear.